Even though I was the one that chose the theme for this edition of Weekend Cookbook Challenge - an ingredient from your region or country - I still had a hard time picking one. I changed my mind at least 5 or 6 times. I was thinking back bacon - which is also known as Canadian bacon. I thought about Saskatoon berries which bring back tons of memories of picking buckets of them when I was a kid. I thought about scallops - out East we have some of the best in the world. I considered cod tongues as my parents have just returned from a trip to Atlantic Canada where they ate them battered, panfried, poached and any other way they were offered. I even thought about doing something with Kraft Dinner because as you may know, Canadians have always been the worlds largest per capita consumer of KD. 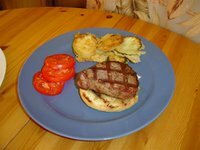 But in the end I decided to stay close to my home and go with Alberta Beef. In my opinion Alberta produces some of the best beef in the world. And I think I can taste the difference too. Even though we eat much less red meat (and meat in general) than we used to, sometimes nothing beats a good steak. The Complete Barbecue Book by Chancellor Press. To find a recipe for WCC was actually the first time I've opened the book since I bought it. 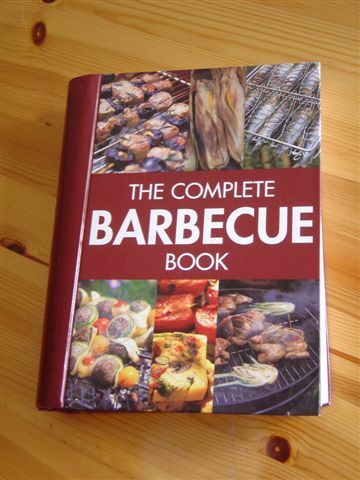 Here's to hoping the weather is mild enough this fall and winter for lots of bbq-ing - this book has some super recipes. 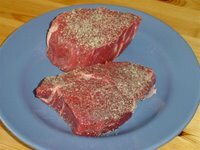 I chose Peppered Steak Flamed with Brandy, and bought 2 delicious looking tenderloins. My side dishes were also Alberta themed; at least in the way that they were grown in Alberta. Tomato slices from Whiskey Creek Tomatoes, which I think are the best tomatos to be found anywhere, and fried slices of baby pattypan squash. I was going to marinate the tomatos or do something with them, but they are so good they don't need to be played with. Our final plate of food - the flaming was the tricky part - at least for me. I have a terrible habit of not always reading recipes through to the end so I have been known to mess up from time to time. Instead of lighting a spoonful of brandy and then pouring it on the steak, I poured the brandy on the meat then tried to light it. Doesn't work. My steak had an extra kick to it that only comes from an idiot (me) pouring brandy over the steak repeatedly until Scott intervened and actually read the directions. Bam! indeed. 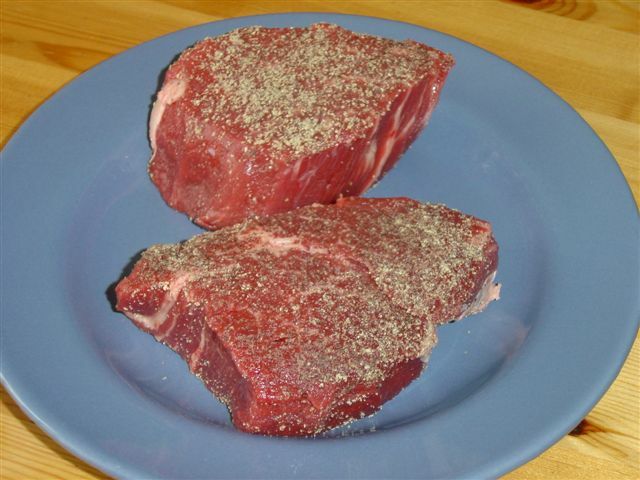 Press both sides of steaks into the peppercorns and season lightly with salt. Combine the melted butter and garlic in a small bowl and brush the mixture all over the steaks. Grill the steaks until they are done how you like them. Just before they are ready, dip the bread slices in the remaining garlic butter and toast both sides on the barbecue. Place the toasted bread on a platter and top each with a steak. Pour the brandy into a heatproof pan or ladle and heat gently on the barbecue (i heated mine in the microwave at 10 second intervals until warm). Carefully set the brandy alight and pour it, flaming over the steaks. Serve the steaks as soon as the flames die down. There's still time to send me your posts to take place in Weekend Cookbook Challenge! Email me a link at iliketocookATshawDOTca! 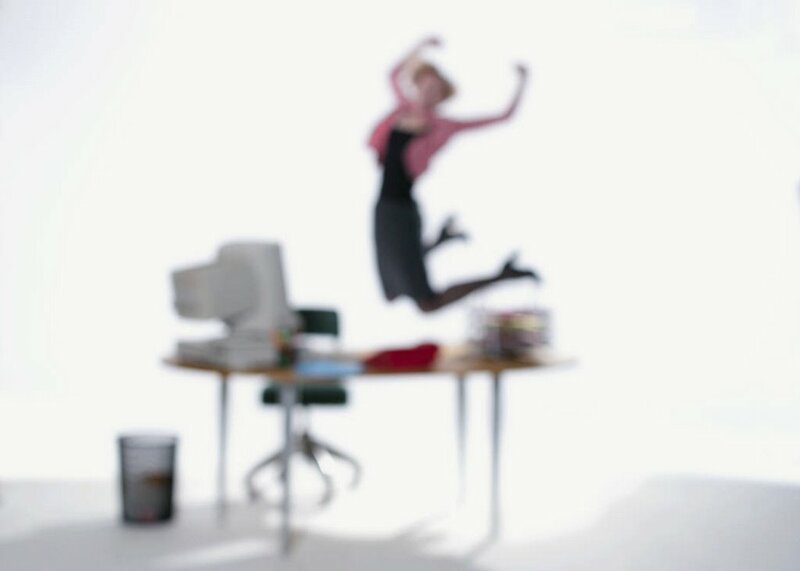 Yes that's me (ok,not really) jumping for joy after reading this article on food blog challenges. The Weekend Cookbook Challenge got mentioned! In a newspaper in Florida, can you believe it? A HUGE thanks to Laura and The Herald Tribune for making my year. This Saturday was a big improvement weather-wise over last, so we went to Millarville. There are only 2 markets left out there this year! That makes me very sad. 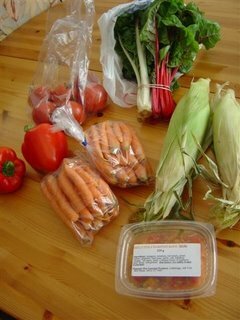 Peppers, tomatos (i will miss them the most), chard, corn, mango salsa and carrots. We had to go to the North part of town Saturday afternoon, something we rarely do, so we used the opportunity to go to the Italian Store (5040 Skyline Way NE, Calgary). 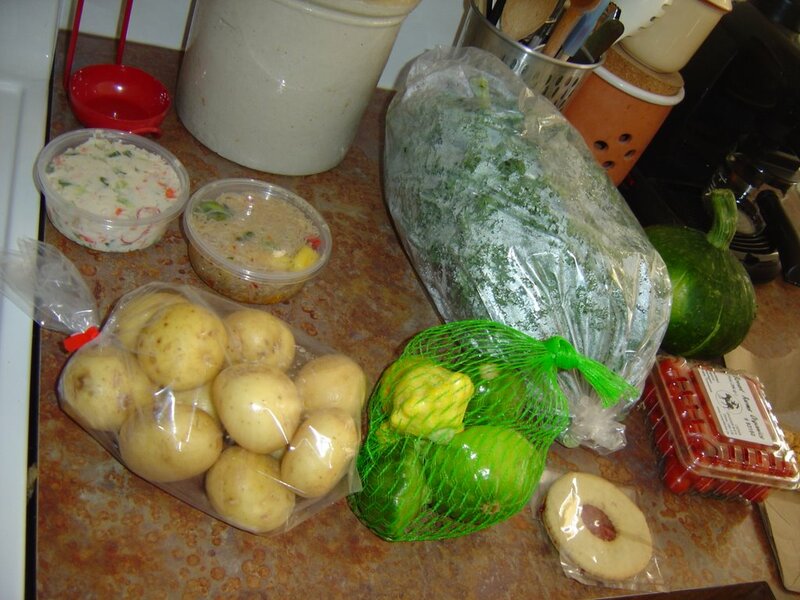 We'd never been but have heard excellent things about both the grocery items and the prepared food from their small deli. I wish I lived in the North, or at least had more reasons to go there. 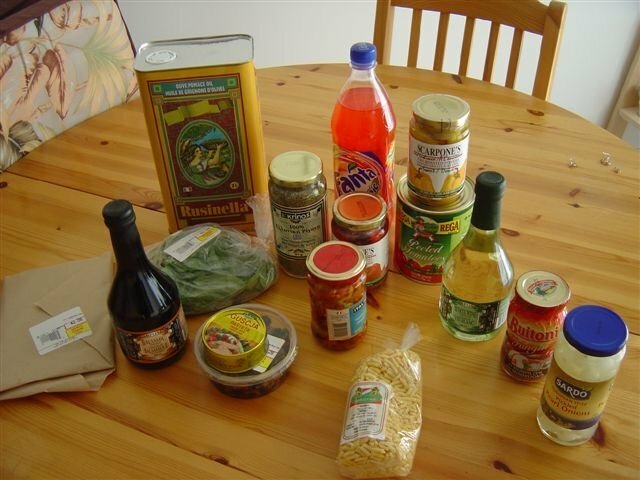 All the food was a fraction of what we pay in other grocery and specialty shops. 3 liters of Olive Oil for under $15. Vinegars, roasted peppers, tomatos, sauces and spreads at least half of what I'd pay at Co-op or Sobeys. The deli was enormous and had us drooling over all the meat, cheese, olives and breads. REMINDER - The deadline to send me your post for The Weekend Cookbook Challenge #9 is October 1! Email me at iliketocookATshawDOTca with your contribution of a recipe made with an ingredient from your home country or regions cuisine! Also, check back tomorrow. I have something to share with you about WCC. We cleaned the portabellas, and baked them for about 10 minutes, gill side down. Then we turned them over, poured in the sauce and crumbled over top a really smooth and tangy goat cheese we were trying for the first time. We baked them for 20 minutes or so, then dug in. Oh, what a dinner. These mushrooms are so meaty and stand up well to stuffing with a juicy drippy sauce and baking. 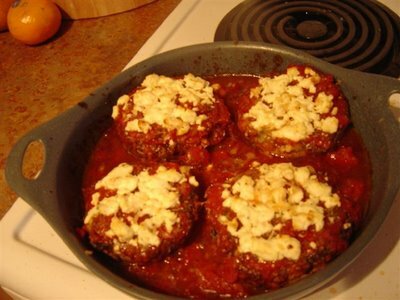 This is by far my favorite portabella recipe we've made. We argued over the leftovers as we do sometimes, and when Scott won, I took some of the leftover sauce, a piece of goat cheese and a wedge of bread to work the next day. At lunch I warmed up the sauce, stirred in the cheese and dipped the bread in. Heaven in a bowl. The last half of last week was absolutely miserable here in Calgary. It started to snow while I was driving home on Friday. Thankfully the snow didn't stick to the ground, but Saturday was a dismal day. When I saw the weather on the morning news that it felt like -10' with the windchill I knew there was no way I was going to Millarville. I burned breakfast and moped around the house for the rest of the morning. In the afternoon we saw a matinee (run, don't walk, and see Little Miss Sunshine.) And then went to a party that night that included alcohol and a hot tub. Sunday morning we dragged our hung-over asses to the Calgary Farmers Market for breakfast and shopping. We split a Ham and Bechamel Crepe and Cinnamon Bun from Ladybug Organic Foods and a smoothie from another stall. We bought some veggies and stuff and headed over to Marda Loop for a walk and some window shopping. The walk wasn't that fun - too windy, and many of the stores are closed on Sundays. So we had a coffee and split a vegetarian burrito at Kaffa before heading home for some Tylenol and a nap. Top picture: crab salad, mango noodle salad, potatos, pattypan squash, cookie, cherry tomatos, more squash, kale. The first frittata I made is written about here when I reviewed I Want My Dinner Now by Renee Pottle. I couldn't belive how easy it was to make, and we have made Renee's recipe for her Greek Frittata over and over this summer. I have noticed lately that more food is coming into the house than is being eaten. I shop for specific meals, then at the last minute change my mind on what I want to make and go back to the store for more ingrediants. Our fridge and freezer are chock-full, and I've already mentioned the state of my pantry. The other night after work I was going to head to the store to pick up some stuff to make Renee's frittata. I decided that in order to start getting our kitchen situation under control I would just use what we already had at home. 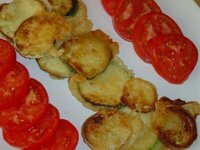 The result was this wonderful Zucchini and Tomato Frittata with Gouda Cheese. Heat the oil in a meduim skillet and saute zucchini garlic and onion until tender. Add tomato and stir for one minute. In a separate bowl, mix together eggs, basil, salt and pepper and 3 ounces of the cheese, shredded. Pour into the pan and reduce heat to medium low. Cover and cook until the eggs are almost set, 10 to 15 minutes. Meanwhile heat broiler. When the eggs are almost set, place pan under broiler until just turning golden, 2 minutes or so. Remove from oven and use a heat resistant spatula to loosen the eggs. Invert onto a serving plate and grate the last ounce of cheese over the top. Serve straight away. PS - I have the most beautiful picture of the frittata, but Blogger won't let me add it. Blogger, you are getting on my last nerve. Is anyone else having trouble with Blogger? Got any advice? When Stephanie at Dispensing Happiness announced that Blog Party #14 would be a kids party, I wasn't sure what to do for a moment. I don't have any kids. I don't have a lot of friends who have kids. Dilemma! But then I decided that I wouldn't let such a small issue such as a child get in the way; I would simply cook something that we would like, but that would also appeal to kids. 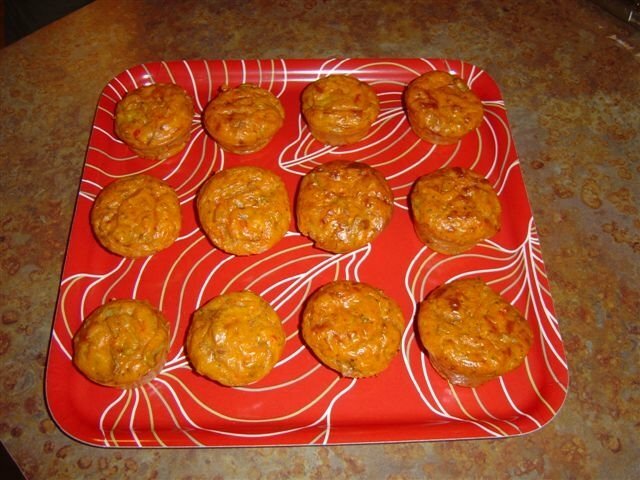 I made these Pizza Muffins because what kid doesn't love pizza? They were very tasty; slightly less firm than a traditional muffin, but I couldn't see any kid turning these down. 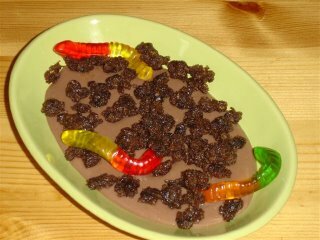 For dessert I made Worms and Dirt; chocolate pudding covered with cookie crumbs with wiggly gummy worms poking out. I know, my picture is awful! Not only is my camera possessed, I bought the wrong sort of cookie - it was sticky and I had a terrible time trying to crumble it up to cover the pudding. But it still tasted delicious. I did make a drink as well but again, camera troubles. We made Swamp Juice - just different flavors of pop mixed together(Cola, Root Beer, Orange, Lemon-Lime etc). I learned this from my formers boss' kid. I think it tastes awful, but it is a hit with kids. Thanks to Stephanie for hosting Blog Party - I always enjoy myself. Can't wait to see what next month will bring. Mix together the pepperoni, red pepper, mushrooms, onion, cheese, tomato sauce, and all the spices. In a separate bowl whisk the eggs, oil, flour and baking powder. Pour into the pepperoni mixture and blend well. 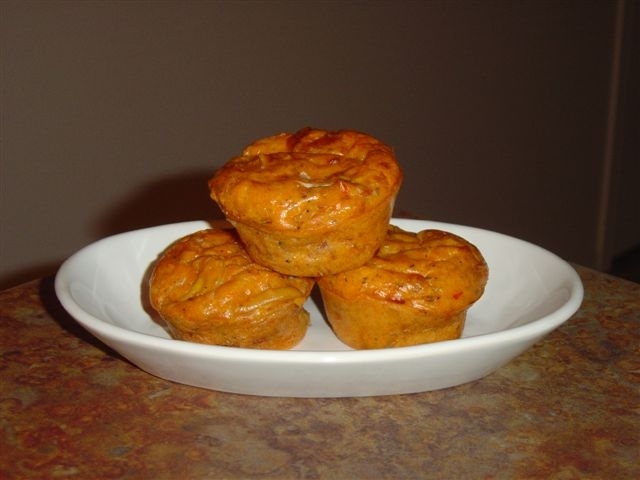 Spray muffin cups with non stick spray and spoon in batter. Bake at 375' for 25-30 minutes or until lightly browned. **NOTE - I use Vegan Pepperoni not only because I like the taste, but it is also much lower in fat. If you prefer, just use the same amount of regular pepperoni. I have no "before" picture, only this glorious "after" picture. Like all the other cupboards, drawers, closets, fridges and freezers around me, my spice cupboard was a gamble to open. Would something fall out at you? And would that something be a plastic bag full of dried mint, or a glass bottle of oil? And would you be able to catch it before it smashed into your face? Or would you simply not be able to find what you are looking for? Many a time I have stared into that cupboard in frustration, knowing that what I am looking for is there, but I just can't locate it. A little while back, I finally had enough and one Saturday morning decided to clean it out. I took everything out and separated what I wanted to keep from all the old stuff that needed to be thrown out. AND finding all the duplicate bottles and bags of stuff that I was forced to buy when I couldn't find the original bottle. That alone took almost the whole day. After that and going to the store for bottles and supplies, the weekend was gone. Friends, it took me TWO WEEKS to get this cleaned up and back in order. But I am thrilled with the results. 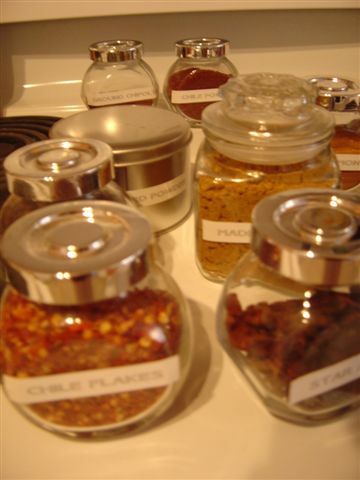 I got rid of all the junk and past it's prime stuff, Everything got a nice bottle, some stuff was moved to the pantry, and my spice carousel on the counter got a makeover too. I also made a list and taped it to the inside of the cupboard door. 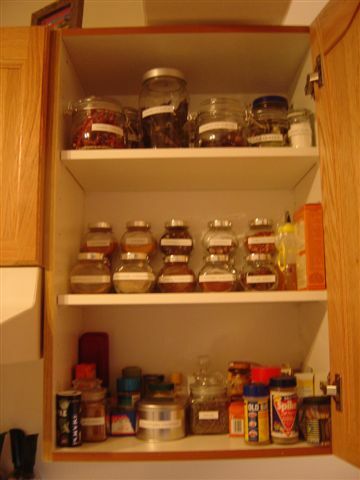 It lists everything that is in the cupboard and everything that is in the carousel. See my cute little bottles? So handy. And I am officially in love with my label maker. Nic at bakingsheet hit another home run with her delicious Cheesecake Cookies. I've made these four times now and every one has just loved them. My boss, he of the flapper pie incident declared they were the best cookie he's ever had. He then told everyone in the office how good they were. And didn't share the cookies I had brought him with anyone. Including me. 1. Make sure the butter and cream cheese are soft so you get a nice smooth cookie like in Nic's picture. 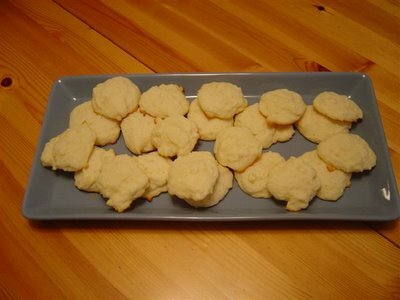 My first batch (in the above picture) were a little lumpy. 2. I added the zest of one lemon - very, very wonderful. The farmers markets are changing now - the cherries, the peaches and other delicious summer fruit is giving way to apples and squash and lots of root vegetables. Since most of the food I bought at last weeks market is still in the fridge, I went light this week. 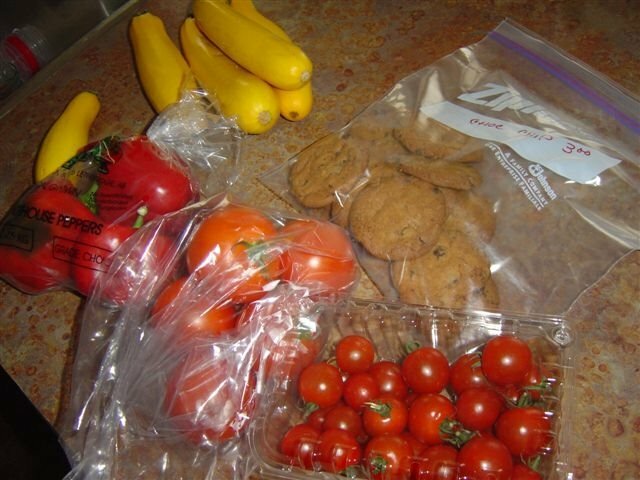 Yellow Zucchini 5 for $2, 3 Red Peppers for $2.75, 6 delicious tomatos for $5, The best Cherry Tomatos I've had this year for $3, and chocolate chip cookies (all the proceeds from the bake sale went to charity, so I had to buy them) for $3. I do love pubs. Sitting around in comfy chairs by the fire, sipping a Strongbow Cider and eating all that "bad" food - not that the food is bad at all; but food that you should certainly not make a habit of eating - nachos, chicken wings, dry ribs and the like. One of my favorite pubs serves chips and curry sauce. Heavenly. Anyone who knows me knows I have a real weakness for the potato. I'd eat them with every meal if I could. 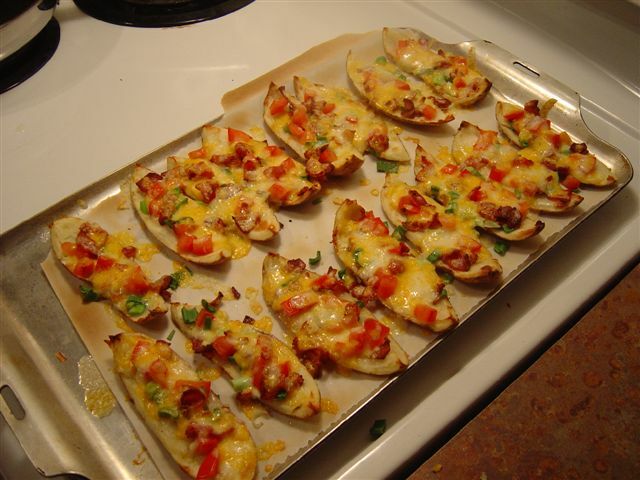 So it's not surprising that my favorite pub snack is potato skins. Not only are they delicious they are a snap to make in your kitchen, if for some crazy reason you are so inclined to stay home rather than head out to your local pub. 1 package marble cheese shredded. Wash the potatos, prick with a fork and bake until tender. Cool slightly, then cut each potato into quarters. Remove most of the flesh from the potatos, reserving for another use. Brush each skin lightly with oil and sprinkle with salt and pepper if desired. Broil for 4 to 5 minutes until the skins are crisp. Top with the onions, bacon, tomato and cheese, and broil until the cheese is melted and bubbling. 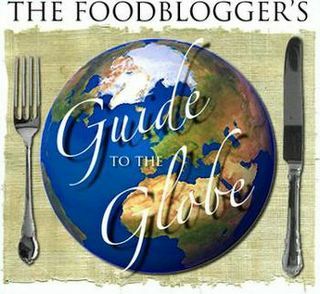 I have been tagged by Linda at Kayak Soup and Jasmine at Confessions of a Cardamom Addict to participate in the Foodbloggers Guide to the Globe started by Melissa at The Traveler's Lunchbox. As I write this, Melissa has just over 1,000 items on the list so far. Amazing. 1. Chocolate from Bernard Callebaut. 2. Dinner at The King and I Thai Restaurant. 3. Wild Boar Pate from Valbella Foods. 4. A big bowl of soup from Route 40 Soup Company. 5. A piece of my world famous homemade carrot cake. Mary from The Sour Dough. Apologies if you've already been asked. Round up is up for WCC #8. Check it out here. The totally super and lovely Ruth from Once Upon A Feast is hosting Weekend Cookbook Challenge #8 and she chose "A Foreign Dish" as the theme. I was psyched for this one; I had recently received a cookbook from my mom that would be absolutely perfect for this challenge. When I was a teenager my family went to Hawaii for a holiday. I had a couple of food ephiphanies that trip and one of them was Thai food. We ate dinner at a restaurant called Keo's that served food unlike anything I'd had in my life. It was an amazing meal for me. My mom bought the cookbook before we left so we could try to re-create some of these amazing dishes at home. Tragically we were never happy with any of our attempts, mainly because the small town we lived in did not carry most of the ingredients needed. Earlier this year my mom gave me her Keo's cookbook to bring home. I was so excited that I filed it on my cookbook bookcase and promptly forgot about it until Ruth announced her theme. Thanks Ruth! 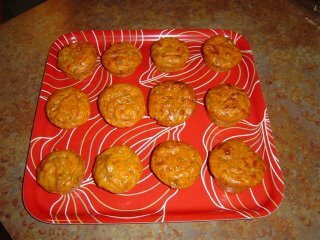 Not only did I have a lot of fun cooking it brought back some sweet memories of vacationing with my family too. This was the dish that always stayed in my memory - one of the best noodle dishes I had ever had in my life. If you try to make this you need to make sure that the rice noodles you use are fryable - they have to puff up. That was the problem my mom and I always had. This time I went down to Chinatown and looked for rice noodles that had directions to fry them on the package. Dice chicken. Shell and devein shrimp; dice. Combine water and tamarind; blend well and strain. In a large saucepan combine chicken, shrimp, tamarind water, ketchup, fish sauce, wine vinegar and brown sugar. Bring to a boil, then turn heat to low, cover and simmer one hour. Set aside to cool. In a wok heat oil over medium high heat. Fry rice noodles a little at a time until they puff up. Remove from wok and drain on paper towel. 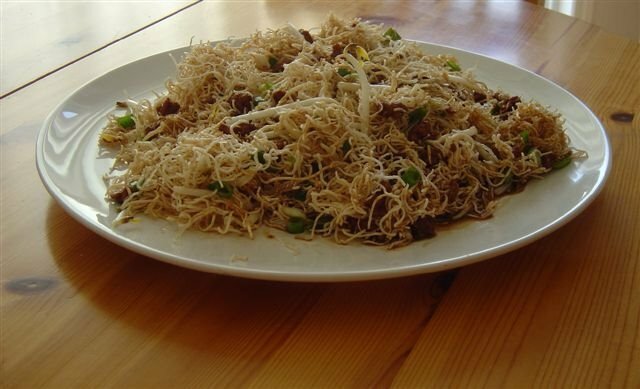 Combine noodles, bean sprouts, green onion and sauce; toss lightly to mix. Garnish with chile peppers and parsley. Cut chicken beef and pork thinly into 2" strips. 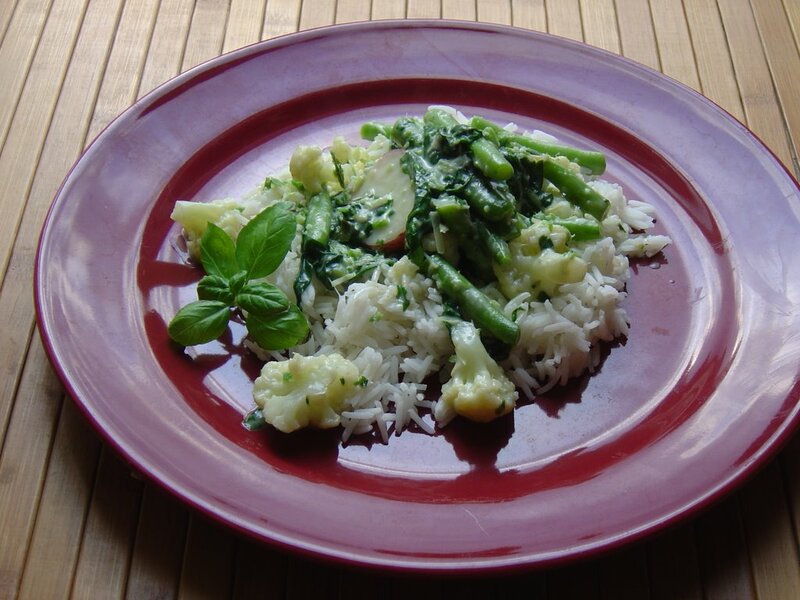 In a food processor or blender combine oil, lemon grass, garlic, chile pepper, curry powder, honey and salt. Blend until smooth. Pour over meat and marinade for at least two hours. 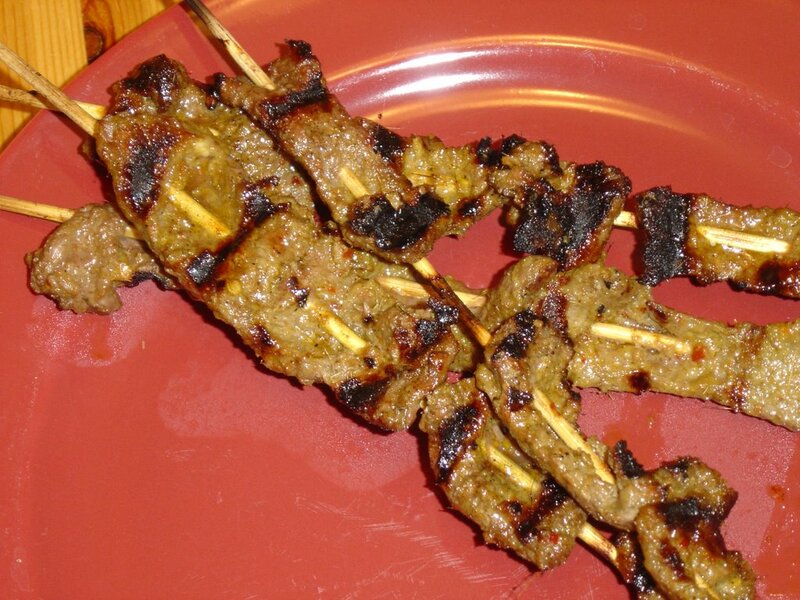 Thread meat onto skewers and barbecue or broil, turning occasionally, until cooked. Serve with cucumber sauce. 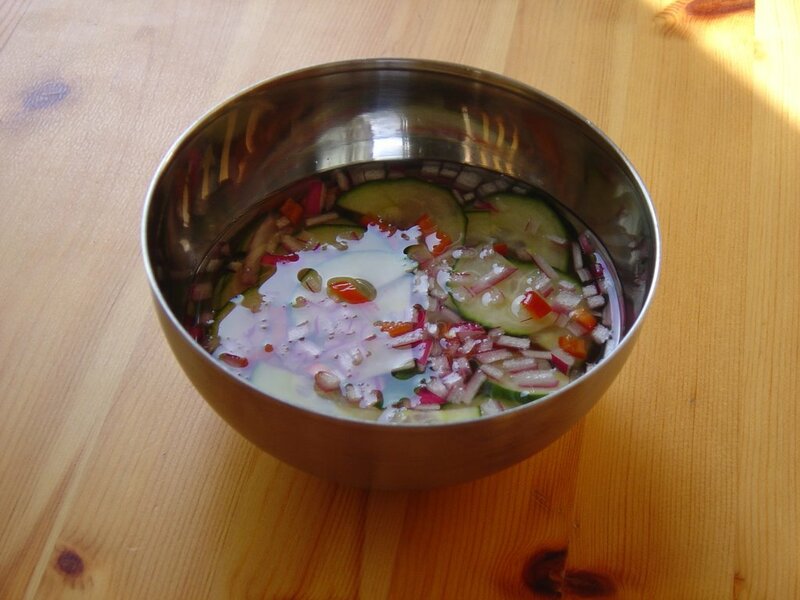 Thinly slice cucumber; place in bowl. Dissolve sugar in boiling water; stir in vinegar and salt. 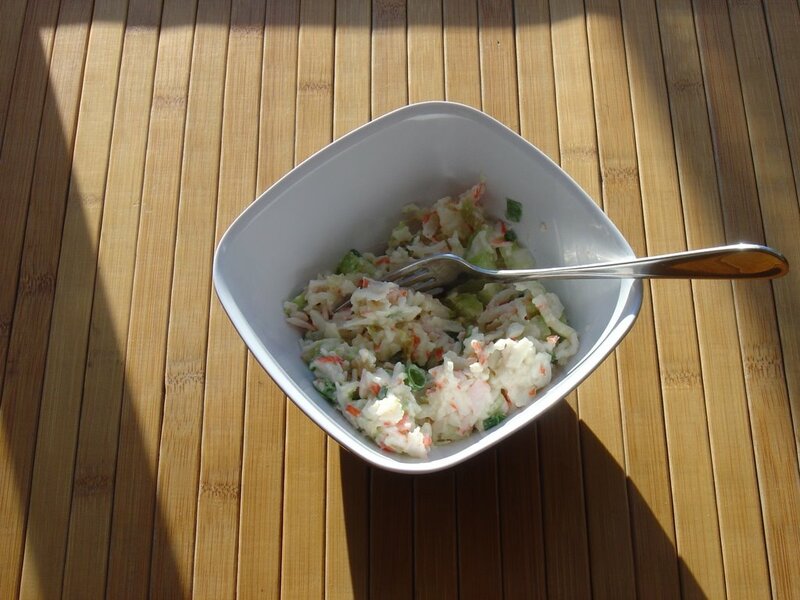 Pour sauce over cucumber slices and sprinkle with chile peppers and green onions. Thinly cut chicken into 2" strips. Grind together chile peppers, lemon grass and lime leaves in a food processor or blender. Heat oil over medium high heat and cook pepper mixture for 3 minutes. Stir in coconut milk and cook 2 more minutes. Add chicken and cook for 5 minutes, until chicken is cooked through. Reduce heat to medium low and stir in basil and fish sauce. Serve on a bed of chopped cabbage. I was totally excited to be invited by Lis from La Mia Cucina and Ivonne from Cream Puffs in Venice to participate in their celebration of summer - La Fiesta al Fresco. My very favorite thing about summer is tomatos. In summer there is sometimes no better meal than a freshly picked tomato, and plate and a knife. Sadly I did not inherit my mothers green thumb for gardening so I rely on the farmers market to keep me in the good stuff all summer long. That season is almost over, so we are taking advantage of the tomatos while we can, eating them every day, in any way we can think of. Here are two of our favorites. Ivonne and Lis I hope these two dishes fit in well with the rest of the feast! Preheat your panini/george foreman-type grill. Mix the mayonnaise and pesto together and spread on all 8 slices of bread. Divide the cheese between 4 bread slices and top with the basil, prosciutto, onion, tomato and remaining bread. 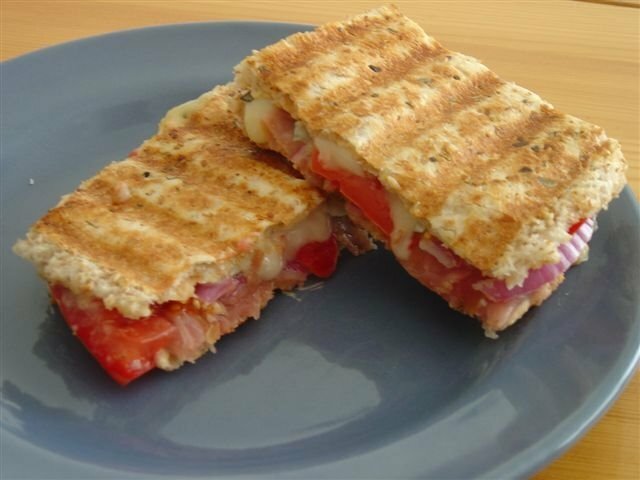 Grill until the bread is toasted and the cheese melts, 4 or 5 minutes. Preheat oven to 450'. Roll or press out dough to 1/2" thickness. 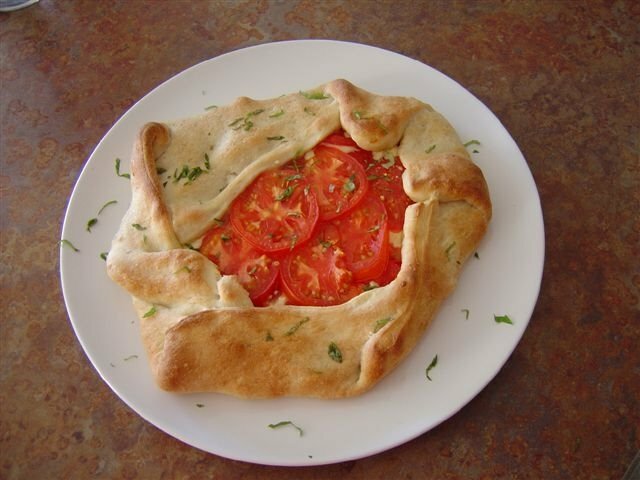 (Dough does not need to be round.) Move to a baking sheet. Heat pan over medium heat and add oil and onion. Cook onion until softened and light brown. Add garlic and continue to cook 3 more minutes. Spread onion mixture over dough, leaving a 2-3 inch border all around. Crumble feta over and top with mozzarella cheese. Season lightly with salt and pepper and scatter basil over. 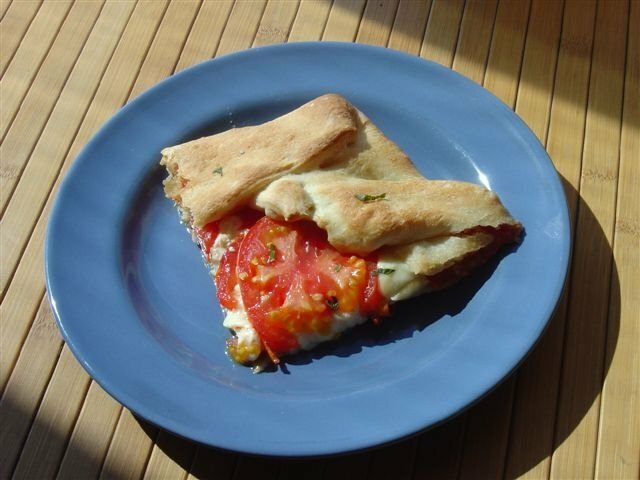 Cover all the cheese with tomato slices, then pull up the sides to close in the cheese but not to cover the top. Bake until golden brown, 25 minutes. Let sit 5 minutes before cutting.